Here’s Rodgers finding James Jones for a first-quarter touchdown in Sunday’s win over Seattle. The arm strength is ridiculous. 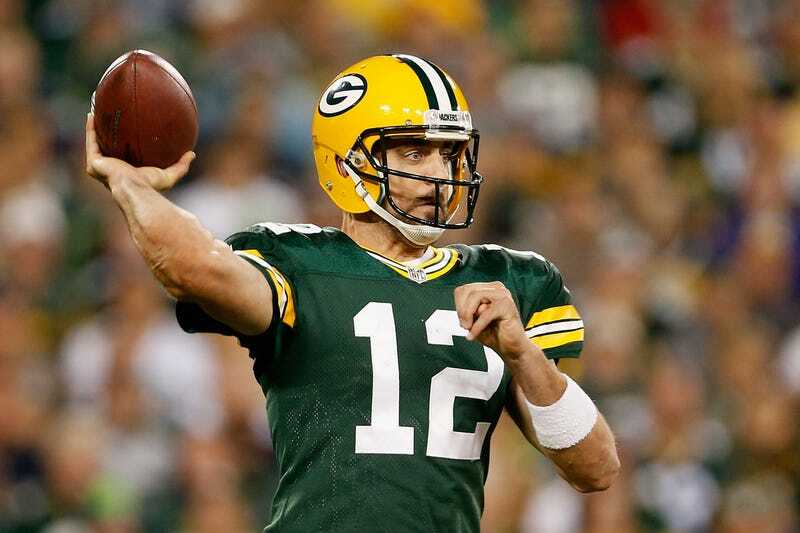 It’s not quite the same thing as the deep-bomb potential from the likes of Flacco or Roethlisberger, but Rodgers’s talent lies in being able to get a frozen rope out of a throw from nearly any arm angle, and regardless of what his lower body is doing. Here’s he’s almost falling away and to his left, but manages to crank out a ball perfectly placed to split the defenders and fast enough to get to his receiver before the window closes. That’s his shoulder and elbow doing all the work, and it’s the kind of throw that no defender expects from a quarterback so off-balance.